I can't believe it is already Thursday again. That means it is time once again for the Creatively Crafty Link Party. I have several new projects to get up on my blog and between sick kids, me being sick, an catching up on everything that didn't get done while people were sick I have not managed to get a new blog post up this week. Hopefully this next week will be more productive for me and I can share some of the things I have ready. Anyway, back to the link party. Thanks to all of you who shared your projects with us last week. As usual each of us will be featuring our favorite projects that were linked up this past week. If you are featured be sure to grab the "featured on" button. Also, be sure to go check out all of the co-host's blogs since we will all be featuring different projects. Now on to the features. 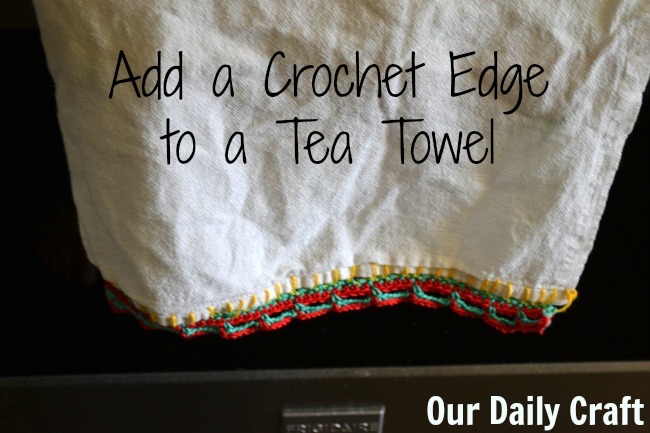 There were several fun projects linked up last week but the project that I chose to feature is the Crochet Edge on a Tea Towel from Our Daily Craft. I haven't done a crocheted edge on something for a long time but I used to do it quite a bit. I enjoyed trying out different edgings to see how they looked. I think I might need to try it again and a tea towel is a great way to do that.